The more we train the more muscle we will build right? That’s the common misconception I get from a lot of people who ask me about their programs and training schedules. Little do they know that what they are doing is in fact causing them more harm than good. 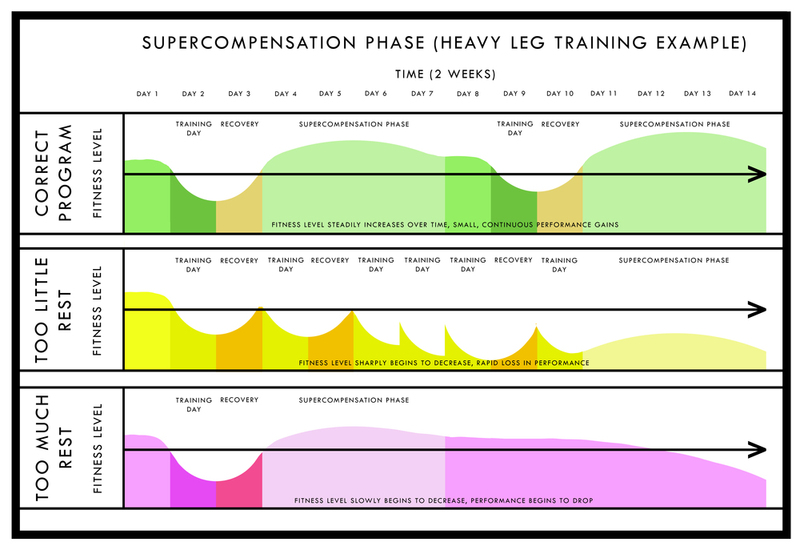 Let me introduce you to a thing called the “Supercompensation Phase”. No, its not some sort of superannuation scheme from the government giving you money back, although I wish it was, but the periodical time lime in which it takes for your muscles to full recover and grow. Unless you are using Anabolic Steroids or any other PEDs your recovery time on a particular muscle is between 4&7 days (depending on the severity of your workout). If your session was too light/easy it can be short-lived and recovery will be quick but you will gain minimal results, if the session is too long or hard or overdone the recovery can take longer than the appropriate time recommended before you next train that same muscle group, so make sure your sessions are efficient. When it comes to planning your training program be sure to make a note if you are training the same muscle group at the same intensity in such a short amount of time. This can lead to muscle strain and damage. So let's say you did chest on Monday and you did 3 reps of 100kg etc and then then you do a similar program on Wednesday doing 3 reps of 100kg again on chest, this is not enough time for your to recover, you need a minimum of 4 days and considering this is heavy it's more likely that you would actually need 5 days to fully recovery. By training the same muscle group too much in a short period of time you are stopping your body from building back up and having fully formed muscles, it’s like building a sand castle halfway and knocking it down and rebuilding it again! I'll see if Rachel can make a graph for me :D. Your body treats this an injury and you wouldn't go and train on an injury half way through it's repair phase... maybe you would if you are stupid. So what does this mean to you and planning your program? Well depending on the amount of times you go to the gym and train means you can train the same muscle group twice but in a different rep range. This is for those people who don’t like doing cardio and would rather do weights again and are bored and don’t want to split their sessions up in to so many different isolated muscle groups. You train 3 days a week usually. So if you want to train again, let's add in another 3 days to the program and do them at 50% of what you do in any of your work sets. This way we are giving the body enough time to recovery and then train again lightly to promote a little bit more muscle growth without overstepping the limits of the compensation phase.